Web Timer is an adware application because it displays commercial content during your web browsing sessions. Some of that content may content outgoing links to dangerous third-party websites, and that is why you should consider removing Web Timer as soon as possible. Albeit the program itself is not dangerous or malicious, it cannot review the links that get embedded in its ads; so technically, it is not responsible for any undesirable consequences you may experience if you click the commercial ads. If you are interested only in removing the application, scroll down to the bottom of this description for the manual removal instructions. We should discuss in greater detail why keeping adware applications on your computer is not safe. As mentioned, the program has no say in what kind of content gets embedded in the advertising space it has. Also, if you check Web Timer’s Terms of Service, you will find the following line: “The Software is free to use and supported by various monetization mechanisms, including but not limited to search, banner, video, image, inline text, and transitional advertising, affiliate links, data aggregation and sales, work distribution, surveys, and sweepstakes.” In other words, the commercial content displayed by this application might be far more prominent that the original function offered by Web Timer. What’s more, when you add this extension to your browser, you agree to the fact that the application can “read and change all your data on the websites you visit.” In other words, it means that the application can monitor your online activity, and it can share this collected information with affiliated third parties. There is no saying what the third parties could do with such data, but it is possible that they will use it for online marketing schemes. As a result, you will be bombarded by various commercial ads that will be, in one way or the other, related to your likes and preferences. Another thing that is rather confusing about this application is that it is sometimes hard to categorize it as a computer security threat. Surely, when a program has an official homepage and even a page on the Chrome Web Store, users are not inclined to consider it a potential security issue. However, let us take a look at the program’s homepage. When you open webtimer.net, you can see that the application supposedly has three supported browsers: Chrome, Opera, and Firefox. Yet, clicking the Install button does not work properly, and you find yourself in the Chrome Web Store. Thus, we can conclude that this app works only on the Google Chrome browser. As far as the original function of the extension is concerned, it is supposed to help you keep track of how much time you spend on one website or the other. At the end of the day, you can check the app and see the pie diagram that tells you which site you frequent the most. However, is it really worth it, considering just how much commercial content this application throws at you? Not to mention that the application might get installed on your PC accidentally. If that is the case, you should seriously remove Web Timer from your browser. At the same time, there could be many other unwanted apps on-board, too. To determine whether your system is being threatened by potentially harmful applications, run a full computer scan with the SpyHunter free scanner. For the most part, you should be able to uninstall all the unwanted applications manually via Control Panel because such programs often have entries in the list of installed programs. However, if you find it too much of a task for you, you can always resort to using a security application that will do the job for you. Once your computer is clean and all the unwanted programs are deleted, please get yourself a security tool that will protect you from similar intruders. Also, you should refrain from opening links to unfamiliar websites. The way you browse the web also impacts your computer’s security, so you should be responsible for your activity online. Finally, if you need any piece of advice about how to safeguard your system against cyber threats, you can always leave us a comment. Press Win+R and type %LOCALAPPDATA% into the Open box. 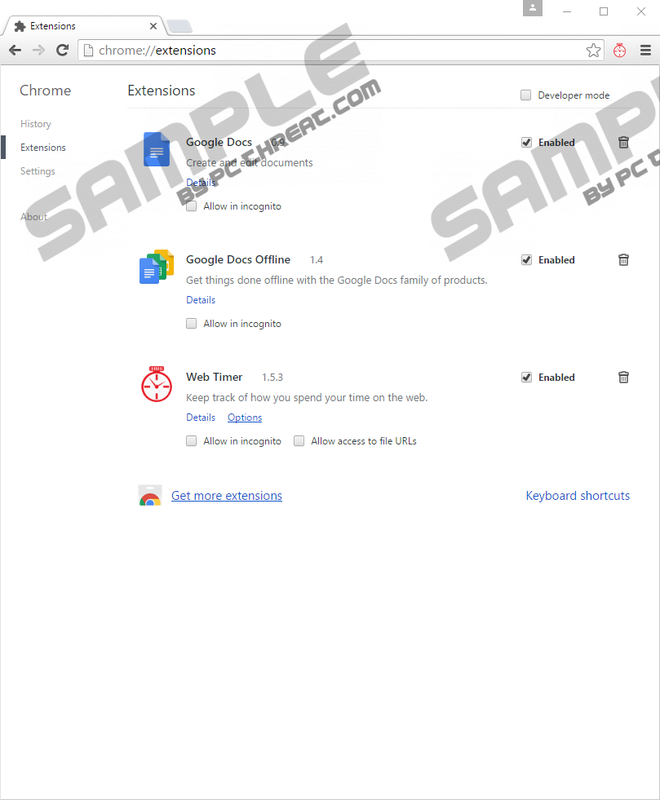 Click OK and navigate to Google\Chrome\User Data\Default\Extensions. Quick & tested solution for Web Timer removal.